We planted lots of grasses and some shrubs in the bush area just below Delta Street. The soil was quite moist after the recent heavy rain so punching holes with the Hamilton tree planting tools was easy. As always, we finished with morning tea and a good chat. 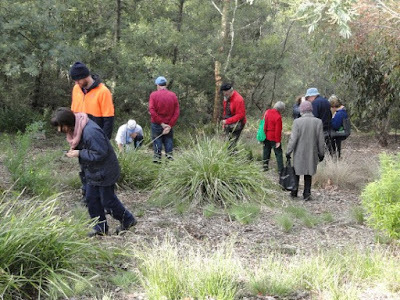 Our next working bee is Sunday 31 July (also National Tree Day) so come to the park to help with some planting and enjoy the free BBQ lunch provided by the City of Boroondara to participants. Please come along to our Fungi Foray on Tuesday, 21st June. It is always fascinating to hear what Geoff has to tell us about the many types of fungi hiding in our urban bush. Bring along your little mirrors, hand lenses and fungi identification books to make the experience even better.